SERVICING - HERNANDO, PASCO, PINELLAS AND HILLSBOROUGH I SPECIALIZE NOT ONLY IN RESIDENTIAL LISTINGs AND SALES BUT ALSO IN COMMERCIAL REAL ESTATE. I AM A MULTI-MILLION DOLLAR PRODUCER WHO HAS LIVED IN THE AREA FOR OVER 20 YEARS. 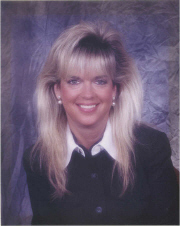 I HAVE BEEN IN THE REAL ESTATE FIELD SINCE 1996, BRINGING SELLERS AND BUYERS TOGETHER. I BELIEVE IN SERVICE FIRST AND A NO PRESSURE SALES APPROACH - SELLERS: I WORK HARD TO GET YOUR HOME SOLD IN THE LEAST AMOUNT OF TIME FOR THE BEST VALUE AND BUYERS: I WILL FIND YOUR DREAM HOME NO MATTER HOW LONG IT TAKES - YOU WILL KNOW WHEN YOU WALK IN THE RIGHT HOME THAT THIS IS THE HOME FOR YOU. This page has been visited 1,054 times.